Realising the needs of students in Kampar, Kinta Saujana Properties Sdn Bhd recently embarked on a project to build a custom-made hostel for their use. The hostel, aptly named MH Unilodge to denote its affinity with students, is modelled after a university hostel in Australia. It comes complete with individual parking bays for the benefit of those with cars. The plus point is that the units are free-hold entities thus owning one has its merits. One other major consideration is the 3-year guaranteed return on offer by Kinta Saujana Properties Sdn Bhd plus a tempting 2-year maintenance fee exemption. Built on a 5-acre site and located slightly over a kilometre from Universiti Tunku Abdul Rahman (UTAR), MH Unilodge has public facilities such as a hypermarket, a hospital and related government departments within reach, thus enhancing its marketability. MH Unilodge comprises three blocks with five design choices covering a floor space measuring between 568.7 sq ft to 855.4 sq. ft. The 22 shop lots and 198 fully furnished apartments come with a gym, infinity pool, library, laundry, indoor and outdoor cafes, discussion room and a BBQ area built with the convenience of students in mind. The area is under constant surveillance provided by CCTV, security guards and a functional electronic locking system. Kampar has caught the attention of investors with the establishment of additional institutes of higher learning besides the TAR campus. Westlake International School and Tunku Abdul Rahman College are the latest to join a long list of institutions making a beeline to Kampar. Thus investing in properties in this former tin-mining town is well worth the effort. For details on MH Unilodge Kampar, call 05-254 3482 or 012-538 1055. 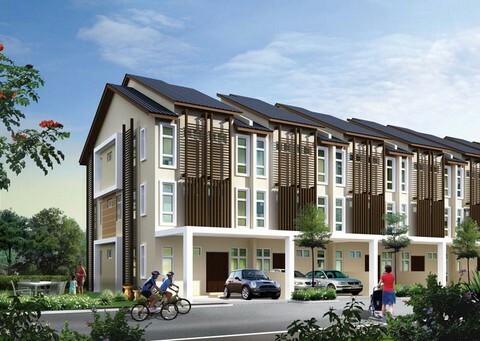 Located just three minutes from Universiti Tunku Abdul Rahman (UTAR) in Kampar, Taman Mahsuri Impian or better known as Kampar Residensi, is a 25-acre modern integrated township connected to the North-South Expressway (PLUS). Developed by Benua Tegas Sdn. Bhd., this new residential development offers two-storey and three-storey terrace houses. The two-storey houses, with a built-up area of 1980 sq ft (22 x 45 ft) and land area 1540 sq ft, are priced from RM328,800 onwards. The three-storey houses, priced from RM458,800, have a built-up area of 1000 sq ft (20 x 50 ft) and land area of 1400 sq ft. Each unit has got thirteen (13) bedrooms and bathrooms attached. Amenities include 24-hour security services and free daily shuttle service to UTAR, which has an enrolment of some 15,000 students. Tesco hypermarket and fast food outlets are located nearby. Some other landmarks are the Grand Kampar Hotel, Tin Mine Museum, the proposed new hospital and an international school. Incidentally, Kolej Tunku Abdul Rahman (KTAR) is within walking distance. The college boasts about 3000 students. There are a total of 205 units of double-storey and 62 units of triple-storey terrace houses. While the 2-storey houses are suitable for purchasers looking for their first home, the 3-storey houses, with 13 bedrooms per unit, make good rental properties to capitalise on the huge, and still growing, student population in Kampar. The estimated rental income per unit will not be less than RM4550 per month. 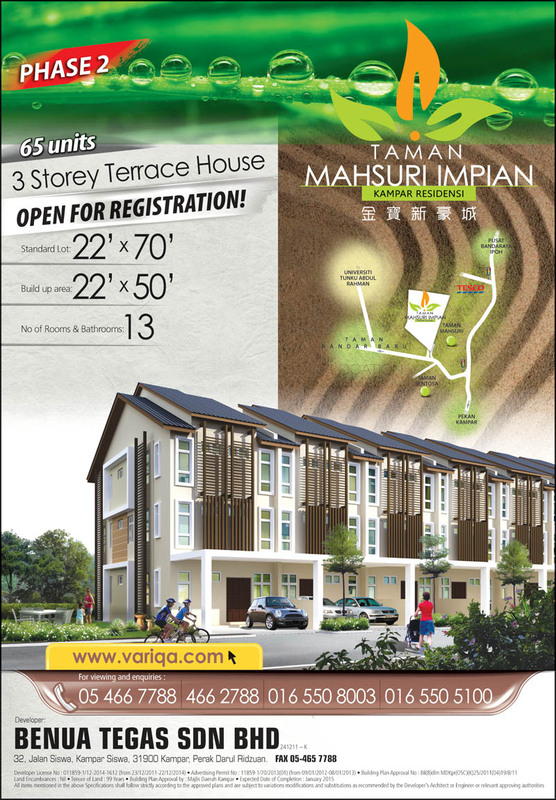 Kampar Residensi will be officially launched on-site on Sunday, September 2 from 10am till 1pm. There will be a lion dance performance and a calligraphy competition. Refreshments will be served. All are welcome to the launching ceremony and to view the show houses thereafter. For more information, contact: Benua Tegas Sdn Bhd, No. 32, Jalan Siswa, Kampar Siswa, 31900 Kampar, Perak. Tel. no. : 05-4667788 or 05‑4662788.